Central bank gold demand spikes to highest in nearly 50 years! There has been a fundamental shift in central banks’ behavior with respect to gold over the past decade. The 2008 financial crisis led central banks to re-evaluate the relevance and importance of gold on their balance sheets. Check out the sudden change in sentiment that occurred in 2009, as central banks shifted from being net sellers to net buyers for the first time in 20 years. While central bank appetite for gold has been strong ever since the financial crisis, it really picked up in 2018. They added 651.5 tonnes to official gold reserves, up 74% versus 2017 to the second highest yearly total on record! Net purchases jumped to their highest level since the end of US dollar convertibility into gold in 1971. Central banks are increasingly looking to diversify their holdings by increasing exposure to gold. This is significant, as central banks are the ‘smart money’ given their influence on global economics and access to non-public information. It makes one wonder what exactly they know that led to the largest increase in gold purchases in nearly 50 years! Is the global economy is greater trouble than they are disclosing? Will the U.S. dollar decline sharply over the next few years or even lose world reserve status? Has the growing global debt burden finally reached levels too high to manage? Of course, this is nothing new to anyone that has studied monetary history. But it is new for a U.S. central bank to publicly admit (warn?) about the possibility of a dollar crisis. The dollar is facing a number of significant headwinds, as nations around the globe are increasingly finding ways to circumvent the dollar in global trade. Russia, China and other nations are de-dollarizing their assets, dumping dollar-denominated U.S. debt while buying gold at a record pace. The trade war with China and potential for the government shutdown to resume are other near-term factors that are weighing on the dollar. Democrats and Republicans appear unable to find a compromise regarding funds for building a border wall. They have until Friday, February 15th, to come up with an agreement or risk another government shutdown. The spike in gold demand is occurring against the backdrop of static supply, up less than 1% during 2018. Mine production was up just 0.8%, the slowest pace of growth in over decade. This is largely a factor of decreased investment in exploration and fewer new mines being built during times when profit margins are compressed. It is also becoming more difficult and expensive to find major new gold discoveries. Increasing demand and flat supply is a clear recipe for higher gold prices. It is too early to tell if the 2018 jump in central bank demand will be sustained, so we will be watching quarterly demand trends closely in 2019. Overall gold demand increased by 4% in 2018. In addition to the bullish supply and demand factor, the Federal Reserve is helping to lift gold prices via a new ‘patient’ outlook with respect to raising rates or reducing their balance sheet. The price spike over the past few months suggests that investors are becoming increasingly bullish on gold. The gold price is up $150 from the August 2018 lows. It has also broken through key resistance levels on the chart, including the 7-year resistance trend line, psychologically-important $1,300 price level and both the 100-day and 200-day moving averages. The RSI momentum indicator is currently at 58, after retreating from overbought levels with the recent pullback. So far the $1,300 level appears to be holding. This is key, as it helps to confirm the breakout when prior resistance turns into new support. Gold still needs to take out major resistance at $1,365 in order to increase our confidence that a new bull cycle is underway. But the recent move is encouraging and if the Federal Reserve is done (or close to being done) with rate hikes, this could ignite the major rally in precious metals. It is not only gold that is seeing an increase in demand lately. According to the U.S. Mint’s most recent update, Silver Eagle sales jumped 24% during January to 4,017,500 ounces. This comes amidst forecasts for increased industrial demand for silver in 2019 and a multi-year decline in silver supply. 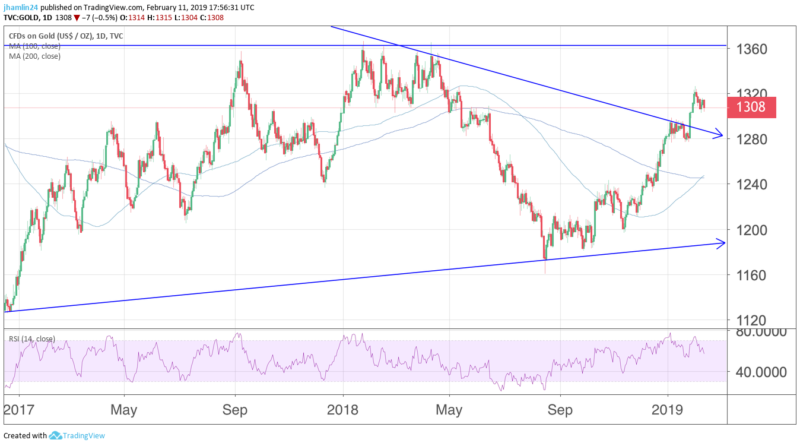 These factors could push the silver price back above $20 in 2019. Gold and silver could be at the start of a new bull cycle, as a number of bullish fundamental and technical factors are emerging. Mining stocks have been offering excellent leverage to the move higher in the metals over the past few months and we expect this trend to continue. The biggest gains are often realized at the start of new bull market cycles and several of our mining stock positions have generated double-digit gains so far in 2019. The post Central bank gold demand spikes to highest in nearly 50 years! appeared first on MINING.com.